Hey Binx. For what it is worth, The Princess has a fleecy blankie just about like yours there. She has pretty much torn it to shreds - gives it a good bite to show disapproval - usually when the slave is late with lunch! Perhaps the snow-white buns are extra-irked by flash photography. Thump away, Binx--the point must be made! What an attractive white bunny you are, Binx! 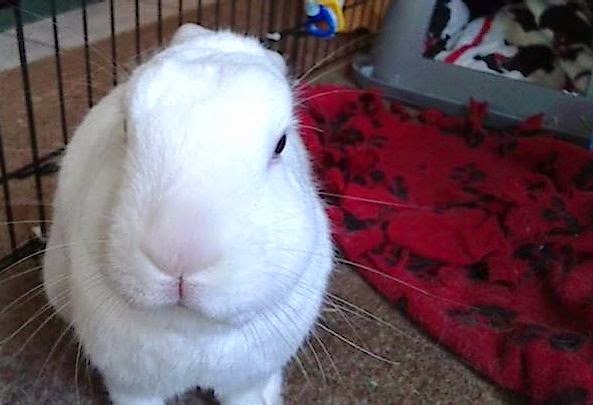 I'm afraid we hoomins are pretty stoopid, so you probably will need to keep *THUMP! *ing to get through to our stoopid hoomin branes! we're not intelligent like you bunnies!